Create professional-looking, easy-to-read signs easily and inexpensively with these stick-on vinyl letters from Westcott/C-Thru BetterLetter. Choose from a variety of eye-catching fonts, colors, and sizes — or use the blank 8" × 10" sheet to create your own customized messaging. 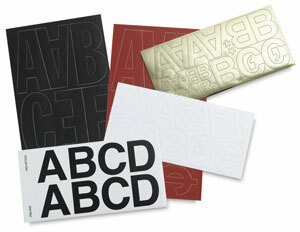 Then simply plan your design, peel, and apply your lettering to any smooth, clean surface. Westcott/C-Thru BetterLetter Vinyl Letters come with either permanent adhesive for long-term durability or repositionable adhesive you can apply, remove, and adjust as needed. Franklin Gothic 4" Franklin Gothic 6" Helvetica 1" Helvetica 1" and 2" Helvetica 2" Helvetica 3" Nueva 2" Nueva 3"
Franklin Gothic 6" Helvetica 2" Helvetica 3" Nueva 2" Nueva 4"